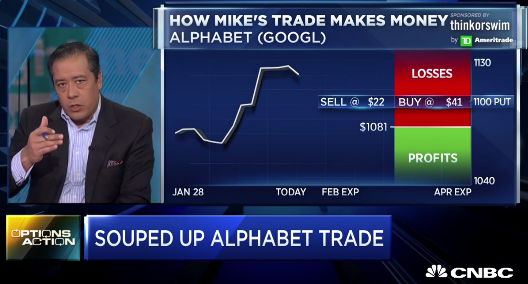 Alphabet (GOOGL), the last of the MAGA complex will report their Q4 earnings tonight after the close. The options market is implying about a 4.5% one day move tomorrow in either direction, which is rich to the average one day move over the last 4 quarters of about 4%, and in line with the 10-year average of about 5.5%. 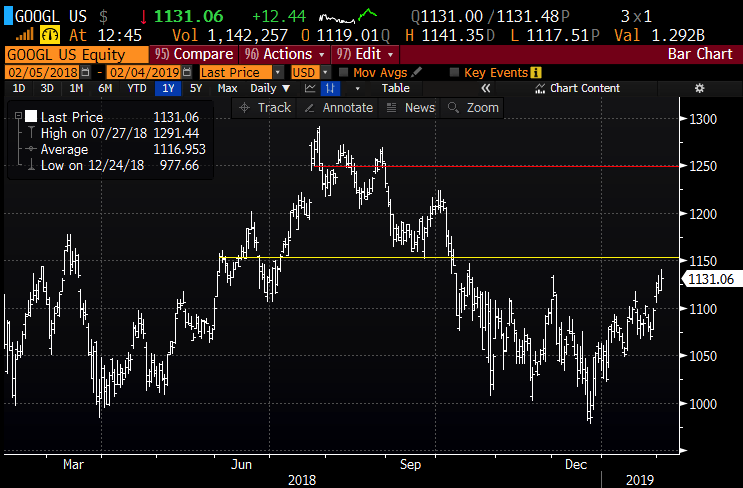 With the stock near $1132 the weekly Feb 8th expiration 1132.50 straddle (the call premium + the put premium) is offered at $53, if you bought that, and thus the implied move, you would need a rally above $1185.50, or a decline below $1079.50 by Friday’s close to make money, or about 4.7% in either direction. This idea seems reasonable to me if you were of the mindset that the company was not going to guide lower, but offer fairly uninspiring commentary. Like the Facebook (FB) earnings trade idea I detailed prior to their results last week, attempting to thread the needle was not a great way to express my view into the print. That said, we have mildly different views here, one technical, that is supposed to be blind of the fundamentals, and one fundamental that should not be impacted by the technicals. For Q4:18, we are expecting Gross Revenue of $38.90B, Net Revenue of $31.41B, GAAP Operating Income of $8.64B, and GAAP EPS of $11.03. Our estimates are above consensus for Net Revenue, Op Income and EPS but below for Gross Revenue (at $39.92B Gross Revenue, $31.30B Net Revenue, $8.61B Operating Income, & $10.89 GAAP EPS). 1) Revenue and Operating Margin Trends for Core Google: We are looking for Core Google Gross Revenue of $38.72B (up 20% Y/Y) and Net Revenue of $31.23B (up 21% Y/Y), driven by ongoing strength in Mobile Search, YouTube and Programmatic. We are also looking for $10.07B in Core Google GAAP Operating Profit (a 26.0% margin, which would be down 70 bps Y/Y). 2) Gross Google Properties Revenue: Within Core Google is Google Properties Revenue which includes core Search and YouTube. We are looking for $26.82B in Gross Google Properties Revenue, which would represent growth of 21% Y/Y. 3) Revenue for Google Other: We are looking for $6.31B in Google Other Revenue, which would represent 27% Y/Y growth and 36% Q/Q growth, largely driven by Q4 Hardware Revenues. Google Other Revenues includes Hardware, Play, and Cloud. 4) TAC: In terms of TAC, we are generally modeling muted ongoing growth (20bps Q/Q for both Google Properties and Network Sites bringing them to 13.3% and 70.1%, respectively). My take into the print? Mega-cap tech results have been all over the board this earnings seasons, starting off with AAPL’s revenue pre-announcement on the first trading day of the year, with others like Intel, Nvidia, Netflix, Amazon and Microsoft disappointing on results or guidance initially sending their shares lower. But for every disappointment, there have been some standouts, Facebook’s 12% rally on better than expected results last week, Service Now and a handful of Semis. GOOGL’s reaction to whatever news they give tonight might be instructive for the broad market after such a sharp decline in December and a sharp bounce in January. So what’s the trade? I suspect that GOOGL will not have an outsized move to the upside like FB, as sentiment is not nearly as bad as FB, and GOOGL’s market cap at nearly $300 billion more than FB, nearing $800 billion is a lot harder to push around. On the flipside, if the company were to miss and guide lower the stock in the coming days/weeks would be on its way back towards support near $1000. Regular readers know we are not huge fans of long premium directional trades into events like earnings, so prior to offering some defined risks ways to play, depending on your views, I’ll offer our usual disclaimer: you need to get a lot of things right to just break-even, first and foremost direction, the magnitude of the move and of course timing. Rationale: This trade risks 20 to possibly make up to 80 in a very wide range to the upside over the next month and a half. Or If I thought the stock would trade back towards support at $1000 on a miss and guide lower I might consider put spreads in March. Rationale: this trade offers a break-even inline with the implied move for earnings, and profit potential of up to 4x the premium at risk, decent risk-reward for those who see the stock back towards 1000 by mid-March.